89 XJ 4L bone stock suddenly after a short drive last week the oil pressure gauge stopped moving, stuck at zero psi. Confirmed that I have adequate oil pressure with tester so guessing this is electrical. New sender and no change any ideas? Did you replace it with the correct sender meant for a gauge and not a switch for the idiot light? The switch physically smaller and maybe $20 and the sender is $45 as I recall. This is from memory, but I think on the sensor higher pressure=higher resistance, so reading zero means it's shorted to ground and unhooking the wire makes the gauge peg itself. Thanks I'll do some searching out the grounds and was thinking along that path. FYI all other gauges working normally. I did replace it with the correct sender a Wells PS 133 from Rock Auto which was the same part number I ordered a couple years ago when I broke off the terminal on the original, which worked fine until this last month. Just tested the resistance on the one that I replaced and 1 ohm @ 0psi is the stated value which I have. Do gauges besides ground or power issues suddenly fail? If so anyone out there willing to part with a working gauge if I need one? There’s a way to test the gauge, I think it was just unplugging it a d grounding it. It should spike one way. And not grounding it goes the other extreme. The wire is more likely to go bad than the gauge in the cluster, that test should show you some kind of results if the wire is good. But it’s possible the gauge is bad, I forget how it’s supposed to react to the ignition being turned to on. I’ll try to see if I can find the testing procedure from the Jeep electrical troubleshooting book, but if memory serves it was essentially grounding the sending gauge wire. Green and everyone thanks for your responses. I thought about grounding the sensor wire but it is carrying full battery voltage 13volts + running so would I not see some sparks or burning up a wire, blown fuse etc.? No. It’ll be fine. Your not trying to put the full battery through that wire, just testing resistance. 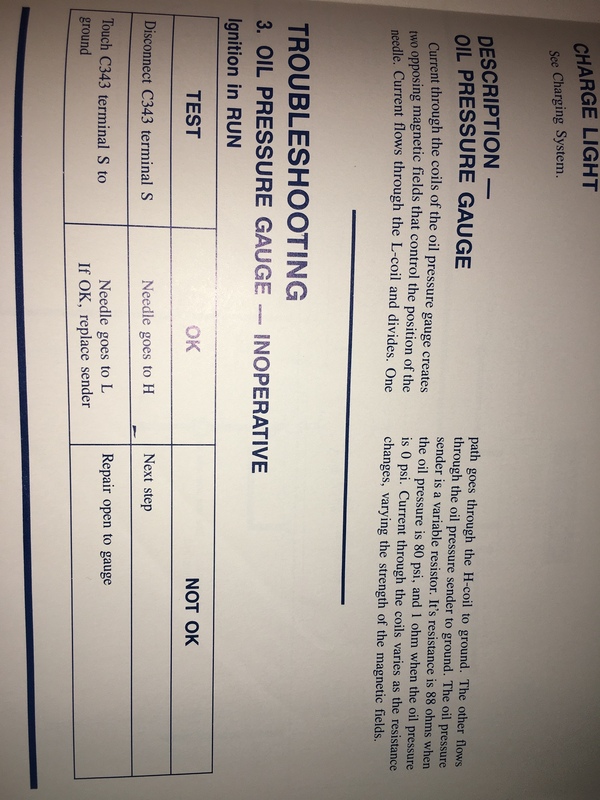 Here is the jeep trouble shooting guide for 1988. If you can zoom in it should explain everything like 1 ohm = 0 psi, 88 ohm 80 psi. Basically disconnected the gauge should read H , grounded L, if that checks out the sender is bad, if not the gauge is bad. But keep in mind that sender wire could have a problem too. Thanks again I will try your suggestions tomorrow and report back with the results. BTW there could be a bad ground some place, but if the other gauges work I’d guess the ground to the cluster is good. If non of the gauges work then bad ground or the fuse is blown. Not entirely sure of perfect grounds on this old guy but will inspect and clean them, I checked and replaced the fuse as number 1 troubleshooting item. All of the other gauges are working perfectly. It's got that bulkhead connector if that is the c101 you reference? I cleaned out that bugger several years ago but may be time to inspect it again. The weather is a bit cold for working with anything plastic at the moment though. No, it’s some kind of weird plug Renix jeeps has 87-88 model years. Yours shouldn’t have it. If you’re bulkhead had issues then maybe it’s still a problem. By bulkhead I am thinking of where the engine harness bolts to the dash harness at the firewall behind the fuse box. Those things are usually greased up good enough they don’t have too many problems unless brake fluid leaks on them and the fuse box from the clutch master cylinder . More likely it’s simple, either bad sender, wire or gauge, even a weird failure of the ignition switch not Turing on the accessories. this is assuming the rest gauges work, that should indicate the rest of the grounds and wiring is working. Although those jeeps like to cause problems if any of the grounds are bad. Will be removing the dash cluster and testing from that end in a day or two so wish me luck. Ground the wire with the key on and observe the gauge. This is the starting point.